Back to the party: first we bought a table. I’ve been dreaming of owning a ridiculously long outdoor dining table for a long time, so I ordered a 12’ picnic table on craigslist and I am obsessed with it. It can seat 16 people (rather snugly), and now I just need to figure out how to more efficiently cook for 16. But anyway…. 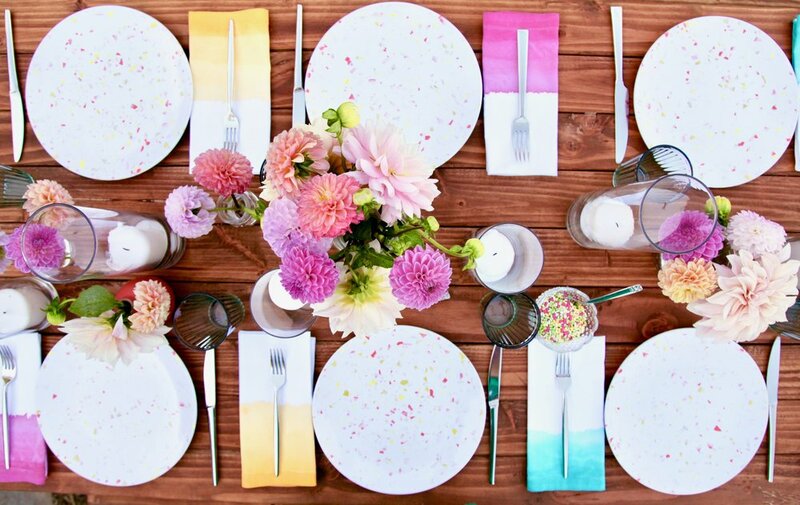 I wanted the dinner to feel luxe without spending a ton of money, so I scoured the clearance racks of my fav stores until I found these plastic terrazzo plates at Target (under $2 each!). We had a ton of candles left over from our wedding last month, so I repurposed them and went on a flower market run for dahlias in a bunch of different shades of white, purple, pink & orange (I don’t think anyone noticed that I used jars & not real vases for most of the arrangements). I also picked up these green glasses from Ikea - I love them because they are neutral enough to go with lots of different tablescapes, but they are still look unique and kind of vintage, and they’re only $6.99 for 6. I think my favorite part of the table, though, was the napkins. 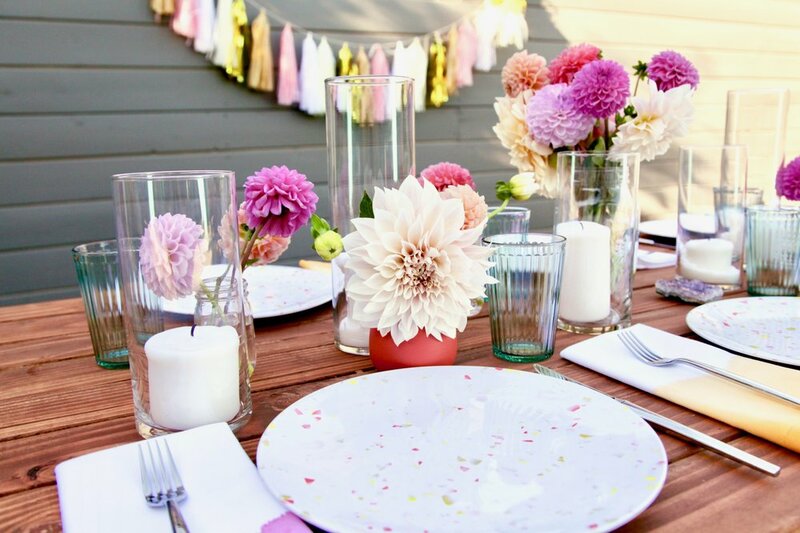 I prefer to use cloth napkins for parties if I can swing it - they make it feel like a real fancy dinner and they usually are so much prettier than paper napkins. 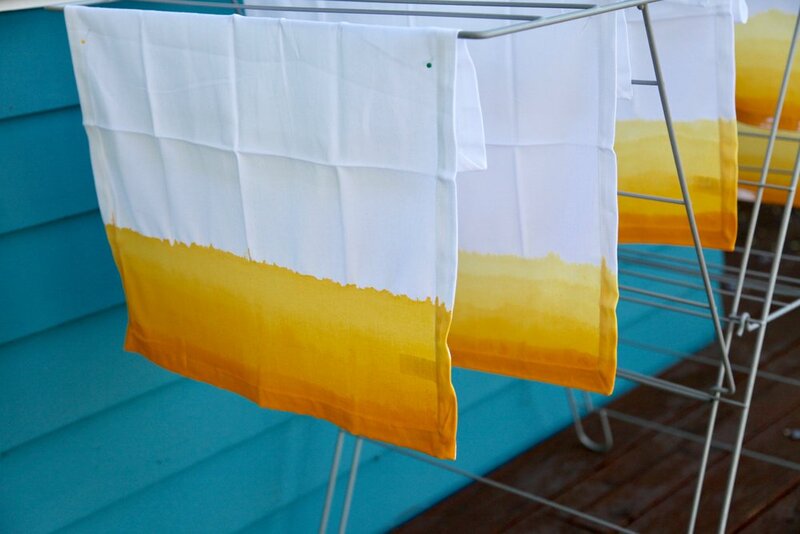 These ombre ones are super easy to make, too - you use acrylic paint instead of dye - so if you want to make them, scroll down to the bottom for the full DIY instructions. 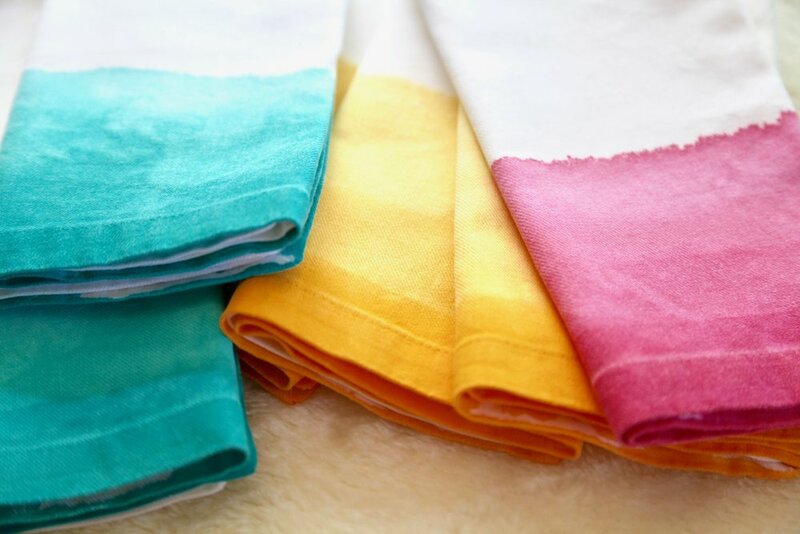 They also are fairly budget friendly as far as cloth napkins go: World Market sells these buffet napkins for $9.99 for 6: I’ve had some for years and they hold up well & get super soft in the wash, so I think they’re a pretty great buy. With so much color on the table, I didn’t need much else in the way of decorations. 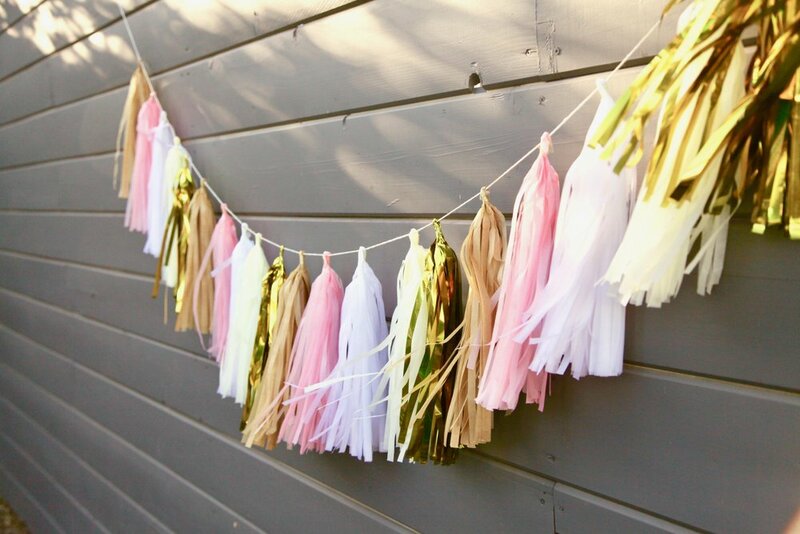 I ordered this tassel garland from Amazon (warning: you have to spend an hour or so putting it together, but it’s kind of a fun thing to do while you watch a TV show or a movie) and thought it was the perfect bit of flare on the wall. For dinner my bestest chef friend Natasha came over and helped me cook copious amounts of Indian food. We made this mango chutney that was AMAZING and these potato cakes (we ended up adding garlic and a lot of salt & they were pretty tasty, but they took me probably 45 minutes to fry them all which in hindsight was not the best plan). We also made this chicken and warmed up a bunch of saag from Trader Joe’s which is surprisingly delish. I put a few small bowls of candy coated fennel seeds out too, and I probably ate half of a bowl myself. 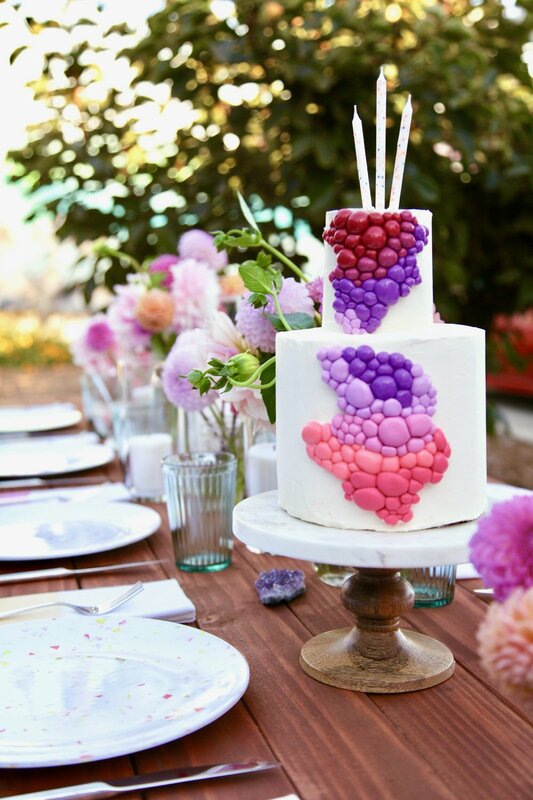 The highlight of the meal was the incredible cake my friend Ashley Adams made for the party. She used the momofuku milk bar funfetti recipe for the cake and it was so tasty & gorgeous and we all just stared at it for a long time before cutting into it. 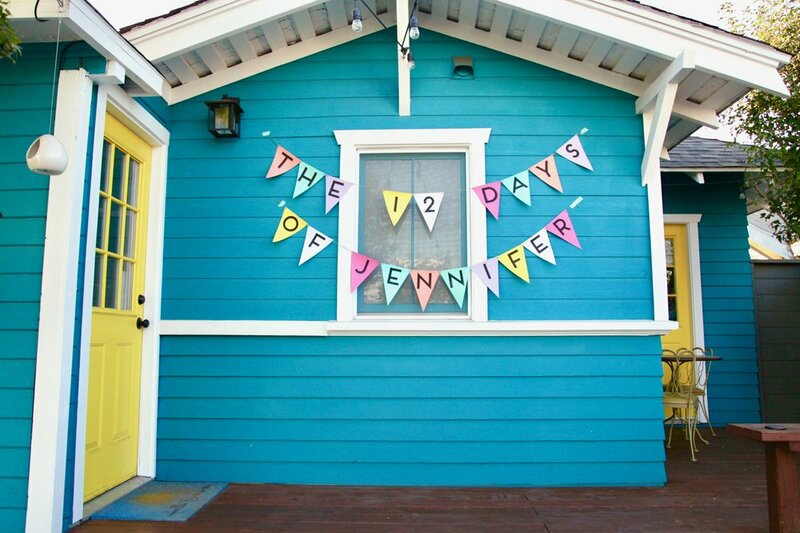 Unfortunately I didn’t get any pictures of the food or the people who attended the party because I was cooking & chatting & doing the things you’re supposed to do at a party, but Jennifer loved it and I love her and that’s the best part of all of this. Start by mixing the paint and the fabric medium according to the directions on the bottle. 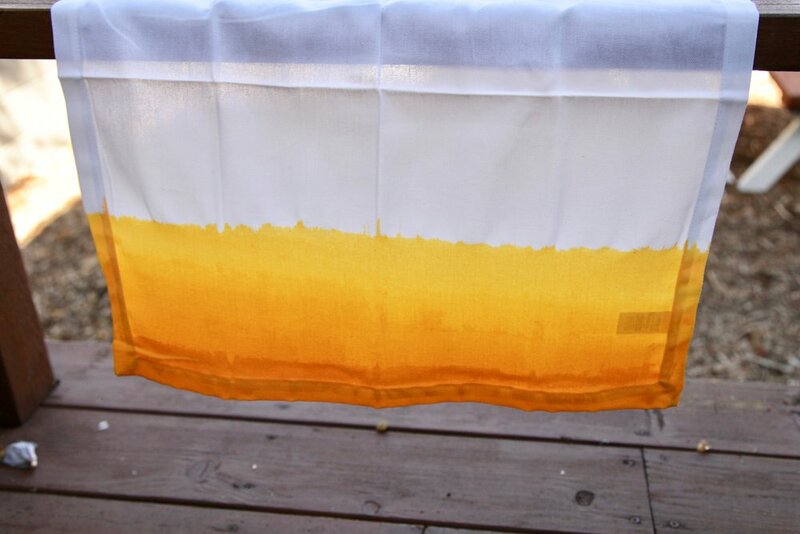 The kind I used called for a half & half mix, so equal parts paint and fabric medium. Mix them together and add a few drops of water. Lay the napkin out on a surface you can stain (a large tarp or piece of cardboard are both good options). 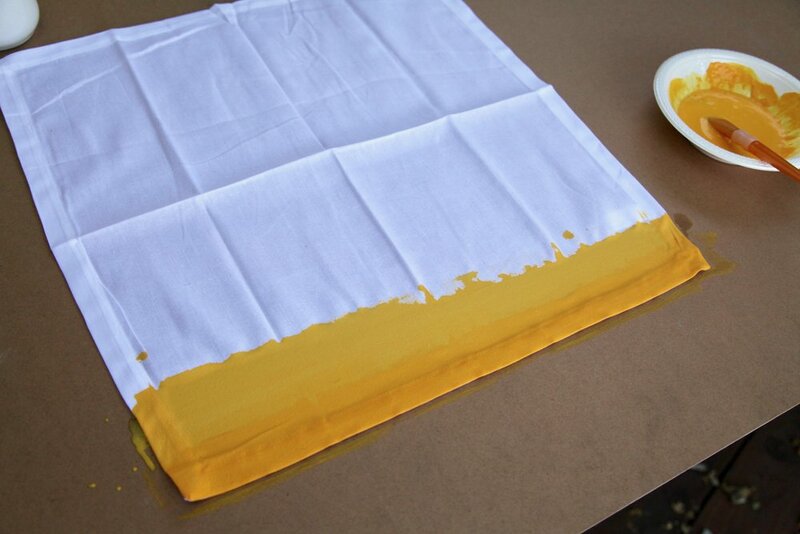 Use your brush to paint a line of color at bottom of the napkin. Repeat this step for all of the napkins you’re making. Next, add a bit of water to your paint mixture. There’s no exact formula here, just add enough that it waters it down a bit and lightens the color (probably a few tablespoons). Use your brush to paint another line of color right about the line you made previously. 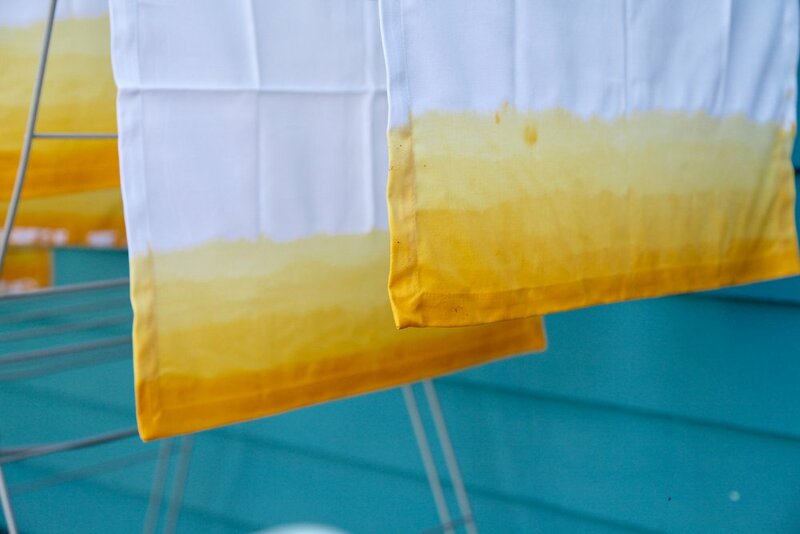 Continue this process a few times, watering down the paint as you go so the napkin takes on an ombre effect. Allow the napkins to dry. Some fabric medium solutions require you to heat set the paint before washing, so if that’s the case, make sure to follow those directions. 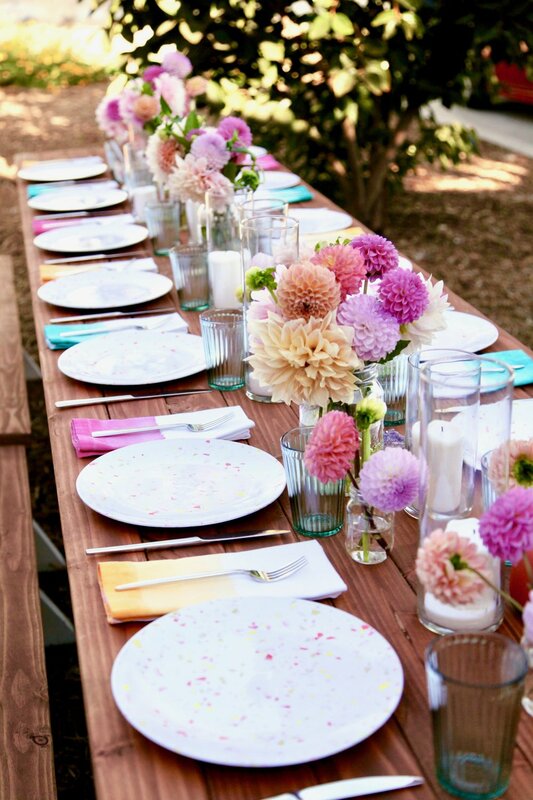 Wash and dry the napkins, and you’re ready for your party!